My intentions for today's "long" run was to go about 7 miles. 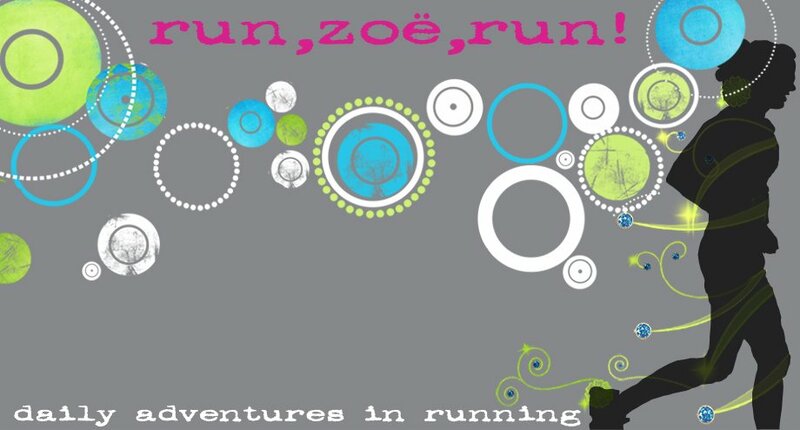 3.5 out and back on the Soos Creek Trail, with Goober in the jogger along with her water bottle and pink/brown bunny. 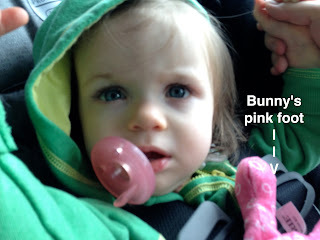 Her bunny is her best friend while in the car (where it lives) because she sings and talks to it while we are out and about. So naturally since I forgot a bink, bunny saved the day from a grueling long run...or so I thought. The only pic I have of L.R.B. ---thanks Karla! Of course I didn't really fuel up for this run, as I didn't think it was necessary since my breakfast was hearty. I did however bring along a water bottle with a lemon-lime nuun tab mixed in, as well as a pack of my favorite Fruit Punch Clif Shot Bloks (my long-run necessity!). Thank GOODNESS for the "food!" So, the run was going really well and we were making pretty good time. Hello 9:14 pace! And at around mile 4 we were bombarded with some local high school track or x-country team on the trail. It kept my mind of my legs and I just ran and ran. Then I realized that it was already mile 6 and there was a little more than a mile left. Woot! Turns out my last mile was 8:35 pace. "Chasing" the young kids on the team helped keep me motivated. I honestly was amazed. As I was taking Goober out of the jogger in the parking lot I noticed that bunny--now dubbed L.R.B. aka "Long-Run Bunny"--was nowhere to be found. Goob didn't like this and was pissed off; screaming and crying. Crap!!! Ok ok ok, we're going to find it. So I retrace our steps. Mile 1 goes by. No bunny. Mile 2 = no bunny. ERGH BUNNY! 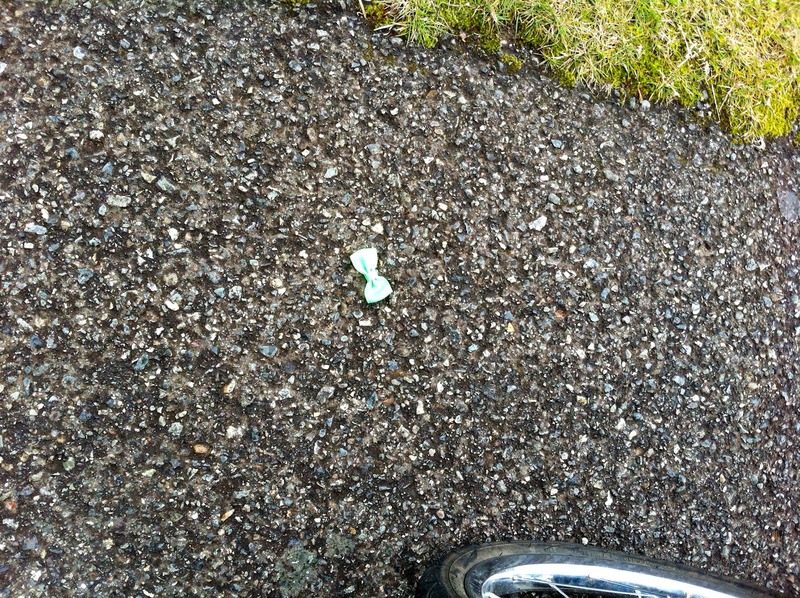 Mile 2.5...no bunny, BUT I did find Goober's green hair bow that she dropped. Didn't even know she was missing it! Well, hello there green bow. Fancy seeing you on this trail. Then I run into this older gentleman and ask him the same question: "Have you seen a pink and brown stuffed bunny along the trail?" Dude proceeds to tell me this...in seriously one breath it seems. "Lost your bunny? Sorry, I haven't seen any pink and brown bunnies running around. Speaking of pink, my brother was a lifelong quadriplegic and he died last May. He had a Pink Panther stuffed animal that he loved and would hug and nod when he wanted to hit at Blackjack. Well, I got that stuffed Pink Panther and kept him in my front window. Turns out he didn't look after the house that well because my $50K trailer that I pull my horses in was stolen and a whole lot of other stuff from the house. I race horses and I'm training for another 50 mile race. I'm not on a horse today, but I will be soon. You might have seen me on my horse last summer on the trail. 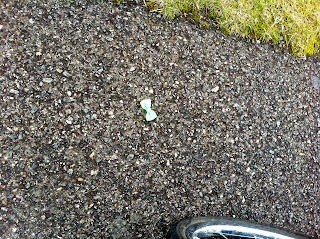 Well, turns out the robbers left their ID, wire cutters and hammer in my home but the police didn't do sh*t. I talked to a Private Investigator today and he's going to help me find out who did this and get my stuff back...."
Anyway, we hit the turnaround point of Mile 3.5 and still no bunny. It's not looking good. I had already eaten the rest of my Shot Bloks and my legs were feeling a little like lead. ...but I did find her hair bow! If I had been in the parking lot at the end of all that, I would have handed you a medal (and a sandwich). Sorry you didn't find the bunny. Hopefully she will accept a replacement soon! Sounds like a great run though, except for the rambler. Awww poor Goob!! I remember that happening once when I was running with Em and she dropped a dollie that my mother-in-law had given her when she was born. Ooops! I retraced my steps and no luck! It took me a while to confess what had happened to dollie! I completely understand... we lose items from the jogging stroller all the time. I don't know how I miss them falling out in the first place?!? Grr, frustrating! You are such a good mommy!! Hope bunny will be found soon!